Floating boat pool keeps the kids in and the jellyfish out. 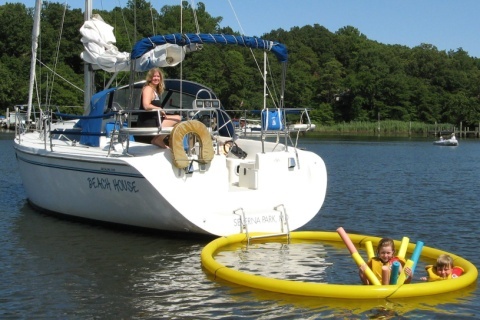 One of the cooler things we saw at a recent boat show was something called the Nettle Net. The Nettle Net is a portable pool that enables you to swim near jellyfish without the fear of getting stung. 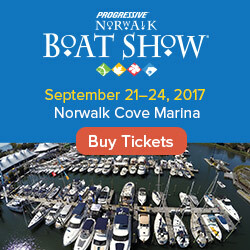 We saw the Nettle Net on display at the Norwalk Boat Show this past fall and our first thought was, "what the heck is that thing?!" The idea was turned into a working product after a professor in Virginia bought a waterfront home in 1978 only to find out that the river was infested with sea nettles - the most common stinging jellyfish of Chesapeake Bay and along the Atlantic Coast. The Nettle Net consists of fine gauge mesh netting attached to an inflatable floating ring. There is a weighted line in the pool netting that allows the interior of the pool to sink to a depth of 8 feet. 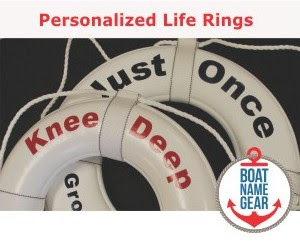 The entire contraption collapses into a mesh bag the size of a beach ball for easy storage on your boat, where space is always an issue. The Nettle Net in action off the stern of a sailboat. Photo courtesy of A Fresh Tack, LLC. Sure, it looked cool at the Norwalk Boat Show, but we wondered if anyone really used this thing, so we did the obligatory Google search. Sure enough, the trusted forum Hull Truth had an entire discussion on the product. Several of the people posting about the Nettle Net attested to its effectiveness, and talked about it being easy to roll up, store, and keep clean (simply hosing it down on the driveway seems to do the trick). One person in the thread was selling his pre-owned pool, claiming it was “only used one time”. There was no explanation as to why he was selling, though another poster proclaimed there was no room on his runabout for such an item. If you've never heard of Zappos, they are an online shoe retailer that provides legendary customer service - they go above and beyond to exceed customers' expectations and increase customer loyalty. One person in the Hull Truth discussion made me wonder whether Zappos learned about customer service from the folks that make the Nettle Net... he stated that his Nettle Net has outlasted 3 boats, and that the company replaced one that was 10 years old when it burst at the seam. Sounds like the company may have gone a little overboard in that case, but with service like that it’s no wonder the product has been selling for more than 30 years.